Bring photo ID and proof of local residency (can be listed on your ID or on a piece of mail such as a utility bill) and stop by the Check-out Desk to fill out a brief form. For those under 18 years of age, a parent or guardian must be present in order to receive a library card. Your library card gives you access to thousands of print and digital materials! Want to start the process right now? Apply for your library card online! We will issue cards to anyone – infants through seniors. Children under 18 years of age must have a parent or guardian present to sign their form. Replacement library cards cost $3.00. We recommend taking a photo of your library barcode and number and saving it in your phone. This photo can serve as a your library card. Can I still check out items if I forgot my library card? We will still check out items to you if you have valid photo ID along. We prefer that you have your library card, but we know that these things happen! Your PIN will default to the last four digits of your phone number when you first register for a card. However, you may change your PIN to whatever you’d like by logging into your account via MonarchCat.org and going to “My Record,” then “Change Logon” (don’t forget to click save!). You may login to your library account online to renew items or call us at 262-284-5031. If there is someone else waiting for the item, you will not be allowed to renew it. Lucky Day items may also not be renewed. For a regular item that does not have a wait list for it, you may renew up to two times. What are the fines for late returns? Book / Audiobook / CD / Magazine fines are $0.10 per day; DVD fines are $0.25 per day. Hot Spots are $1.00 per day. There are no fines for e-materials (they return themselves when they’re due!). Yes, we accept cash/coins, check, debit, or credit card payments. For debit and credit card payments, it must be at least a $3.00 payment. 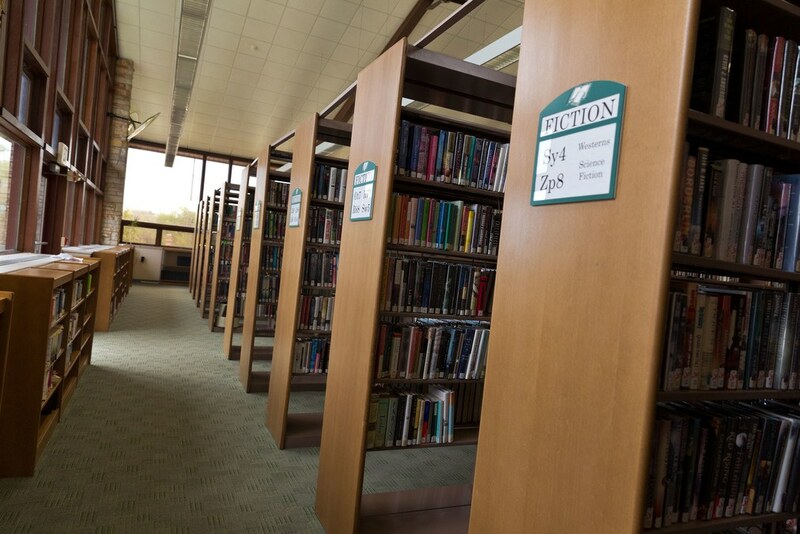 You may pay your fines in person at the Check-out Desk or via your online library account. By signing your library card application, you agree to being responsible for items that you check out. If these items are lost, damaged, or returned with missing pieces, you will be charged the cost to replace the item plus a $5.00 service fee. We typically wait about 5 weeks before you will be charged because often times lost items do surface (did you check under the seats of your car?). What is the maximum number of items I can check out at a time? The limit is 100 items per cardholder. With our Lucky Day items (popular materials that are non-holdable), you may have 1 Lucky Day DVD checked out at a time and 2 Lucky Day books. You may have 5 DVDs/Blu-rays total checked out at a time per library card. What is the maximum number of items I can have held at one time? The limit is 25 items held at one time per cardholder. Of these 25 holds, 10 of them may be DVDs/Blu-rays. Sure do! We also have hot spots that you can check out for 2 weeks to provide Wi-Fi wherever you’d like! How old do you have to be to use the computers? To login to our adult internet stations you must be 18 years or older, unless a parent or guardian gives permission. There are youth computers in the Children’s Library that children under 13 years may use with parent or guardian supervision. Can someone help me use a computer? Our library staff are available to answer basic computer questions. If you need more in-depth help, please schedule a Tech Time appointment with a librarian. You may do this in person or by calling 262-284-5031. It is $0.20 per side of the page for black & white and $0.50 per side of the page for color (letter size / regular paper size). Scanning is free. See the full price list here. Can I rent out the Community Room? Yes you may! Read more about our Community Room rentals here. Being a City of Port Washington Department, all library job openings will be posted on the city website. We are very grateful for our many wonderful volunteers! To get connected, please join our Friends of the Library group, which helps support and raise funds to enhance the library. Wow, what a nice children’s area! Can I leave my kid here while I go grab a coffee? Sorry, but no. Children 8 years of age and younger should always be accompanied by a responsible adult who is within eyesight of the child. We love having children in the library, but we are here to offer library services — not child care. Yes, we keep items in our lost and found box for about 6 months. Please stop by the Check-out Desk on the upper floor or call 262-284-5031. Thank you for thinking of us! We do accept donations of items that are in good condition (no mold, smells, stains, scratched or missing discs, etc.) and are at least somewhat recent (in general published within the last 10 years). We do not accept textbooks or encyclopedias. When you donate your materials, you are also agreeing that we, the library, may choose what we do with them (most often this is either adding it to our library collection or selling them in our Friends of the Library book sale, which supports the library). View our full donation guidelines here. We receive a small amount of printed state and federal tax forms. These are free for the public to take while supplies last. Some forms are now only available online. Library staff may assist you with printing these forms. You may also request to have forms and instruction booklets mailed directly to your residence for free. Learn more at irs.gov and revenue.wi.gov. Yes! We do offer free exam proctoring. Appointments must be made at least a week in advance for this service. To set up an appointment, contact Adult Services Librarian Darcie Kileen at dkileen@monarchlibraries.org or 262-284-5031. Yes! We do offer free notarizing. Adult Services Librarian Darcie Kileen is a notary available for this service. Please contact Darcie at dkileen@monarchlibraries.org or 262-284-5031 to confirm her availability.